Connection no. 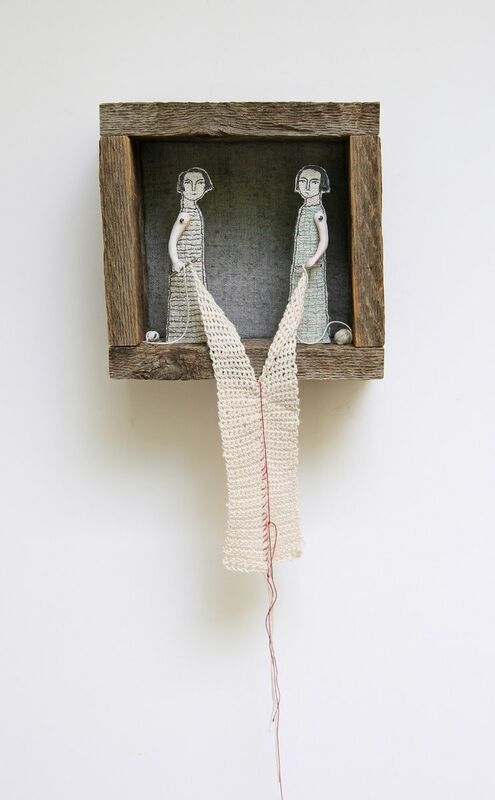 8 is embroidered with soy silk, bamboo and cotton floss on antique homespun linen.The porcelain doll arms are from Germany and were dug from the earth from the grounds of an old doll factory that operated between 1890-1910. 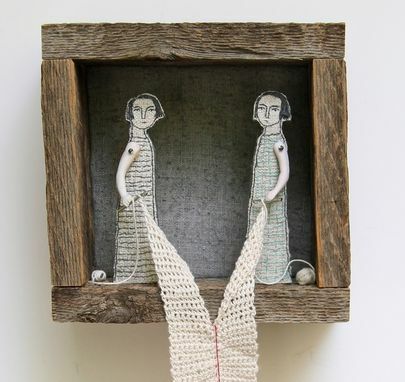 The piece is housed in a reclaimed barn wood frame and backed in hand embroidered antique linen and rayon/wool blend felt. Each figure holds a tiny crochet hook with half of a hand crocheted blanket that is stitched up the center with red thread and hanging needle. The piece measures 7 inches square and is 3 1/2 inches deep. It can be hung on the wall with the hook attached on the back or can sit on a shelf or other surface.